How can I download more symbols with one click (then the few default symbols) ? 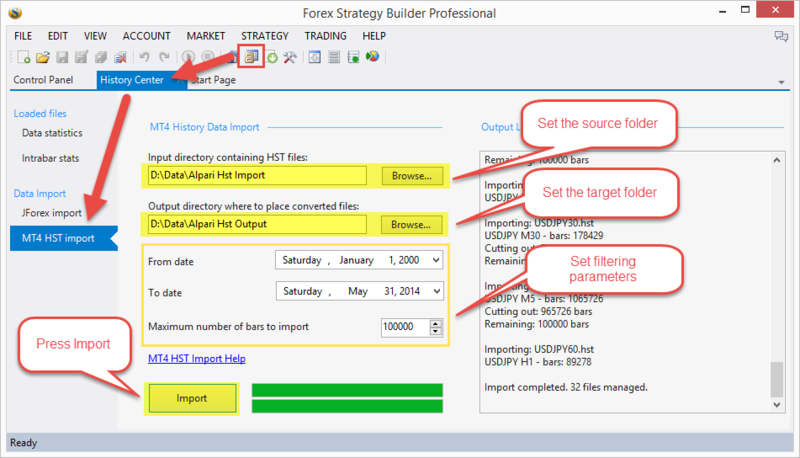 The total number of symbols depends on the broker, but it does not change when I click the button on certain MT4 broker in FSB Pro for data download option. In case I do not want to scroll through every time for updated data, but I used FSB symbol script to export all symbols from Market Watch. Now I want to download them with one click in FSB Pro. Of course I can edit the data download json in system folder of FSB Pro. But it depends on Broker and I can set this json file only once. Any best workaround here ? It should be possible with one click to download all updated data from MT4 Broker. Best I think would be, FSB select all symbols from control menu dependent to certain MT4 Terminal, ready to download in History center/ data download for MT4. Actually the symbol list does not change when I choose different data source than FSB Demo Data. You can import all HST files form MT with one click. Can someone provide that ForceLoadHistoricalData_mod.mq4 for loading all chart data of all opened charts. Maybe Footon (?) could provide that file please. Thanks in advance, because I know from other thread in Premium section he got it. Perhaps someone could modify that ForceLoadHistoricalData_mod.mq4 so that all data from marketwatch are downloaded step by step ? At the moment what I read is, that you have to open all the charts first. On more than 500 symbols e.g. that's time consuming. Same to Popov's Export Data to CSV.mq4 script. You have to apply on each chart. Best is after ForceLoadHistoricalData Script that all data are downloaded from Marketwatch too with a modified Export Data to CSV.q4 script. An ultimativ Export Data to CSV script would be if there is an option of overriding the old data or adding the new data to old data to keep database updated (and keep the older from Charts too). Because the brokers limit on bars from actual date counting and older data disappear. This is a better version of that script. It uses 28 pairs by default and can be edited to more too. Only saving all charts data with one mouse click script is still missing. Output History.ex4 can be a solution, as indicator for MT4 with good freedoms, to write all the price data to files at once. then it will be even a greater help.